While most users may have not realized it, Twitter has had a rather annoying problem for some time now: If you deleted a tweet, it would still reside in Twitter Search’s index. This meant that if you said something you didn’t mean to, or made a mistake that you hoped to correct by deleting the tweet, it was still easily accessible by anyone who simply typed your username into Twitter search. Finally, that’s no longer the case. Now, when you delete a tweet, it will instantaneously be removed from Twitter’s search index as well. We’ve tested it out this morning, and it is in fact the case. 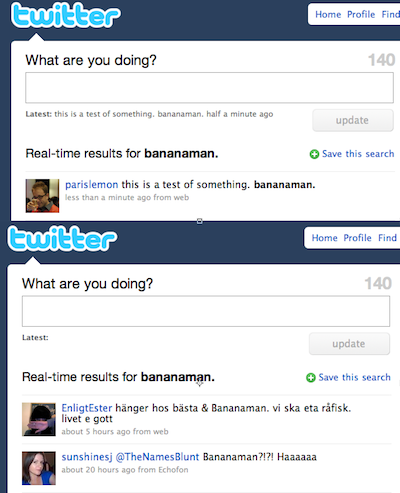 Even better, those tweets are also removed from the search API. We’ve tested several third party apps, and none contain the tweets that I deleted. This is good news for users from a privacy perspective, as deleted tweets showing up in searches have been troublesome in the past. In one extreme example, a series of tweets that were sent the night two people died in a sweat lodge, but then were deleted, resurfaced on Twitter search. Of course, with retweets and various services indexing and pulling tweets now, there’s still a very high likelihood that anything you tweet, will still exist somewhere on the web even if you delete it. Speaking of indexing tweets, the reason Twitter finally got this done may have had something to do with its new search deals with Microsoft and Google. It’s one thing for deleted tweets to show up in Twitter Search, but imagine if a tweet you really didn’t want to send was sitting at the top of a Google search result page. Awkward. It’s also worth noting that a few services which specialized in finding deleted tweets, like Tweleted, are likely dead in the water now. I tried to use it this morning to find my removed tweets, and it returned no results.